After the holidays, there is always a full refrigerator, and if your house is anything like mine, you have to figure out how to use all that “leftover” food. The chef side of me says waste nothing, but having leftovers day after day is not too appealing (for me and causes a complete rebellion by the family). As I dug through what was left the other morning to determine how I might “re-over” a meal and make something more exciting and different for breakfast, I found my inspiration in my leftover mashed potatoes. 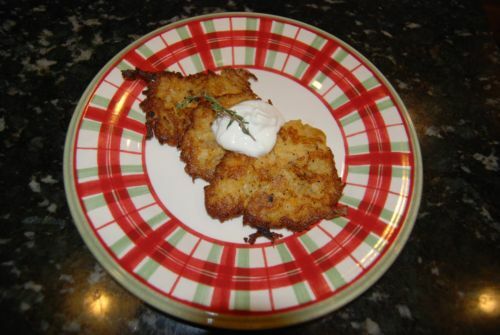 Long ago, a friend of mine’s mom used to make the best potato pancakes (at least in my memory). I’ve always tried to replicate them, and this recipe is as close as I have gotten. Additionally, I had a flash of inspiration on how to put a Southern twist on the Eastern European staple with Sweet Potato Panc akes. Easy preparation: take all the ingredients and mix them together in a bowl. The consistency should be a light batter clinging to the strands of potato. To cook, utilize your largest skillet and put about a quarter of an inch of oil in the bottom. Using medium high heat, place a heaping spoonful of the potato batter into the pan, spreading it into a 2-3 inch pancake. I can usually make three at a time in my 12-inch skillet. Cook in the oil until golden; then flip and cook the next side until golden. Don’t be in too much of a rush to flip the pancakes, as they will fall apart. 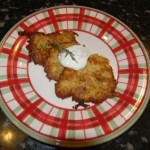 Serve with sour cream or applesauce. For the Southern version, use cooked sweet potatoes instead of the mashed potatoes, and add a dash of either cinnamon or nutmeg, or to simplify, use apple pie spice. They will have a nice orange hue, a hint of sweet, and the layer of spice that will serve as a nice side for a grilled chicken breast or a pork chop.